1. Hear and be comforted, beloved, how merciful is God. To the sinful woman He forgave her offenses; yea, He upheld her when she was afflicted. With clay He opened the eyes of the blind, so that the eyeballs beheld the light. To the palsied He granted healing, who arose and walked and carried his bed. And to us He has given the pearls; His holy Body and Blood. He brought His medicines secretly; and with them He heals openly. And He wandered round in the land of Judea, like a physician, bearing his medicines. Simon invited Him to the feast, to eat bread in his house. The sinful woman rejoiced when she heard that He sat and was feasting in Simon's house; her thoughts gathered together like the sea, and like the billows her love surged. She beheld the Sea of Grace, how it had forced itself into one place; and she resolved to go and drown all her wickedness in its billows. 2. She bound her heart, because it had offended, with chains and tears of suffering; and she began weeping (with herself): "What avails me this fornication? What avails this lewdness? I have defiled the innocent ones without shame; I have corrupted the orphan; and without fear I have robbed the merchants of merchandise, and my rapacity was not satisfied. I have been as a bow in war, and have slain the good and the bad. I have been as a storm on the sea, and have sunk the ships of many. Why did I not win me one man, who might have corrected my lewdness? For one man is of God, but many are of Satan." 3. These things she inwardly said; then began she to do outwardly. She washed and put away from her eyes the dye that blinded them that saw it. And tears gushed forth from her eyes over that deadly eyepaint. She drew off and cast from her hands the enticing bracelets of her youth. She put off and cast away from her body the tunic of fine linen of whoredom, and resolved to go and attire herself in the tunic the garment of reconciliation. She drew off and cast from her feet the adorned sandals of lewdness; and directed the steps of her going in the path of the heavenly Eagle. She took up her gold in her palm and held it up to the face of heaven, and began to cry secretly, to Him who hears openly: "This, O Lord, that I have gained from iniquity, with it will I purchase to myself redemption. This which was gathered from orphans, with it will I win the Lord of orphans." 4. These things she said secretly; then began to do openly. She took up the gold in her palm, and carried the alabaster box in her hands. Then hastily went she forth in sadness to the perfumer. The perfumer saw her and wondered, and fell into questioning with her; and thus he began to say to the harlot in the first words he spoke: "Was it not enough for you, harlot, that you have corrupted all our town? What means this fashion that you show today to your lovers — that you have put off your wantonness and hast clothed yourself in modesty? Heretofore, when you came to me, your aspect was different from today's. You were clothed in goodly raiment, and brought little gold; and asked for precious ointment, to make your lewdness pleasant. But lo! Today your vesture is mean, and you have brought much gold. Your change I understand not; wherefore is this fashion of yours? Either clothe you in raiment according to your ability, or buy ointment according to your clothing. For this ointment becomes not or is suited to this attire. Can it be that a merchant has met you, and brings great wealth; and you have seen that he loves it not, the fashion of your lewdness? So you have put off your lewdness and hast clothed yourself in meekness, that by various fashions you may capture much wealth. But if he loves this fashion because he is a chaste man in truth, then woe to him! Into what has he fallen? Into a gulf that has swallowed up his merchandise. But I give you advice, as a man that desires your welfare, that you send away your many lovers who have helped you nought from your youth, and henceforth seek out one husband who may correct your lewdness." 5. These things spoke the perfumer, in wisdom, to the harlot. The sinful woman answered and said to him, to the perfumer after his discourse, "Hinder me not, O man, and stop me not by your questioning. I have asked of you ointment, not freely, but I will pay you its value not grudgingly. Take you the gold, as much as you demand, and give me the precious ointment; take you that which endures not and give me that which endures; and I will go to Him who endures, and will buy that which endures. And as to that you said, about a merchant; a Man has met me today Who bears riches in abundance. He has robbed me and I have robbed Him; He has robbed me of my transgressions and sins, and I have robbed Him of His wealth. And as to that you said of a husband; I have won me a Husband in heaven, Whose dominion stands for ever, and His kingdom shall not be dissolved." She took up the ointment and went forth. 6. In haste went she forth; as Satan saw her and was enraged; and was greatly grieved in his mind. At one time he rejoiced, and again at another he was grieved. That she carried the perfumed oil, he rejoiced in his inward mind; but that she was clad in mean raiment — at this doing of hers he was afraid. He clave then to her and followed her, as a robber follows a merchant. He listened to the murmurs of her lips, to hear the voice of her words. He closely watched her eyeballs (to mark) whither the glance of her eyes was directed; and as he went he moved by her feet (to mark) whither her goings were directed. Very full of craft is Satan, from our words to learn our aim. Therefore our Lord has taught us not to raise our voice when we pray, that the Devil may not hear our words and draw near and become our adversary. So then, when Satan saw that he could not change her mind, he clothed himself in the fashion of a man, and drew to himself a crowd of youths, like her lovers of former times; and then began he thus to address her: "By your life, O woman, tell me whither are your footsteps directed? What means this haste? For you hastes more than other days. What means this your meekness, for your soul is meek like a handmaid's? Instead of garments of fine linen, lo! You are clothed in sordid weeds; instead of bracelets of gold and silver, there are not even rings on your fingers; instead of goodly sandals for your feet, not even worn shoes are on your feet. Disclose to me all your doing, for I understand not your change. Is it that some one of your lovers has died, and you go to bury him? We will go with you to the funeral, and with you will (take part with you) in sorrow." 7. The sinful woman answered and said to him, (even) to Satan, after his speech: "Well have you said that I go to inter the dead, one that has died to me. The sin of my thoughts has died, and I go to bury it." Satan answered and said to her, (even) to the sinful woman after her words: "Go to, O woman, I tell you that I am the first of your lovers. I am not such as you, and I place my hands upon you. I will give you again more gold than before." 8. The sinful woman answered and said to him, even to Satan after his discourse: "I am wearied of you, O man, and you are no more my lover. I have won me a husband in heaven, Who is God, that is over all, and His dominion stands for ever, and His kingdom shall not be dissolved. For lo! In your presence I say; I say it again and I lie not. I was a handmaid to Satan from my childhood unto this day. I was a bridge, and he trode upon me, and I destroyed thousands of men. The eyepaint blinded my eyes, and (I was) blind among many whom I blinded. I became sightless and knew not that there is One Who gives light to the sightless. Lo! I go to get light for my eyes, and by that light to give light to many. I was fast bound, and knew not that there is One Who overthrows idols. Lo! I go to have my idols destroyed, and so to destroy the follies of many. I was wounded and knew not that there is One Who binds up wounds; and lo! I go to have my wounds bound." These things the harlot spoke to Satan in her wisdom; and he groaned and was grieved and wept; and he cried aloud and thus he spoke:— "I am conquered by you, O woman, and what I shall do I know not." 9. As soon as Satan perceived that he could not change her mind, he began to weep for himself and thus it was that he spoke: Henceforth is my boasting perished, and the pride of all my days. How shall I lay for her a snare, for her who is ascending on high? How shall I shoot arrows at her, (even) at her whose wall is unshaken? Therefore I go into Jesus' presence; lo! she is about to enter His presence; and I shall say to Him thus: "This woman is an harlot." Perchance He may reject and not receive her. And I shall say to Him thus: "This woman who comes into Your presence is a woman that is an harlot. She has led captive men by her whoredom; she is polluted from her youth. But You, O Lord, are righteous; all men throng to see You. And if mankind see You that You have speech with the harlot, they all will flee from Your presence, and no man will salute You." 10. These things Satan spoke within himself, nor was he moved. Then he changed the course of his thought, and thus it was that he spoke. "How shall I enter into Jesus' presence, for to Him the secret things are manifest? He knows me, who I am, that no good office is my purpose. If haply He rebuke me I am undone, and all my wiles will be wasted. I will go to the house of Simon, for secret things are not manifest to him. And into his heart I will put it; perchance on that hook he may be caught. And thus will I say unto him: By your life, O Simon, tell me; this man that sojourns in your house is he a man that is righteous, or a friend of the doers of wickedness? I am a wealthy man, and a man that has possessions, and I wish like you to invite him that he may come in and bless my possessions." 11. Simon answered and thus he said to the Evil One after his words: "From the day that (first) I saw Him I have seen no lewdness in Him, but rather quietness and peace, humility and seemliness. The sick He heals without reward, the diseased He freely cures. He approaches and stands by the grave, and calls, and the dead arise. Jairus called Him to raise his daughter to life, trusting that He could raise her to life. And as He went with him in the way, He gave healing to the woman diseased, who laid hold of the hem of His garment and stole healing from Him, and her pain which was hard and bitter at once departed from her. He went forth to the desert and saw the hungry, how they were fainting with famine. He made them sit down on the grass, and fed them in His mercy. In the ship He slept as He willed, and the sea swelled against the disciples. He arose and rebuked the billows, and there was a great calm. The widow, the desolate one who was following her only son, on the way to the grave He consoled her. He gave him to her and gladdened her heart. To one man who was dumb and blind, by His voice He brought healing. The lepers He cleansed by His word; to the limbs of the palsied He restored strength. For the blind man, afflicted and weary, He opened his eyes and he saw the light. And for two others who besought Him, at once He opened their eyes. As for me, thus have I heard the fame of the man from afar; and I called Him to bless my possessions, and to bless all my flocks and herds." 12. Satan answered and said to him, to Simon after his words: "Praise not a man at his beginning, until you learn his end; hitherto this man is sober and his soul takes not pleasure in wine. If he shall go forth from your house, and holds not converse with an harlot, then he is a righteous man and no friend of them that do wickedness." Such things did Satan speak in his craftiness to Simon. Then he approached and stood afar off, to see what should come to pass. 13. The sinful woman full of transgressions stood clinging by the door. She clasped her arms in prayer, and thus she spoke beseeching:— "Blessed Son Who hast descended to earth for the sake of man's redemption, close not Your door in my face; for You have called me and lo! I come. I know that You have not rejected me; open for me the door of Your mercy, that I may come in, O my Lord, and find refuge in You, from the Evil One and his hosts! I was a sparrow, and the hawk pursued me, and I have fled and taken refuge in Your nest. I was a heifer, and the yoke galled me, and I will turn back my wanderings to You. Lay upon me the shoulder of Your yoke that I may take it on me, and work with Your oxen." Thus did the harlot speak at the door with much weeping. The master of the house looked and saw her, and the color of his visage was changed; and he began thus to address her, (even) the harlot, in the opening of his words:— "Depart hence, O harlot, for this man who abides in our house is a man that is righteous, and they that are of his companions are blameless. Is it not enough for you, harlot, that you have corrupted the whole town? You have corrupted the chaste without shame; you have robbed the orphans, and have not blushed, and have plundered the merchants' wares, and your countenance is not abashed. From him your heart [and soul] labour [to take]. But from him your net takes no spoil. [The text is defective here.] For this man is righteous indeed, and they of his company are blameless." 14. The sinful woman answered and said to him, even to Simon when he had ceased: "You surely are the guardian of the door, O you that know things that are secret! I will propose the matter in the feast, and you shall be free from blame. And if there be any that wills me to come in, he will bid me and I will come in." Simon ran and closed the door, and approached and stood afar off. And he tarried a long time and proposed not the matter in the feast. But He, Who knows what is secret, beckoned to Simon and said to him:— "Come hither, Simon, I bid you; does any one stand at the door? Whosoever he be, open to him that he may come in; let him receive what he needs, and go. If he be hungry and hunger for bread, lo! 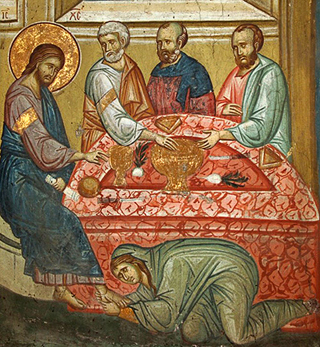 In your house is the table of life; and if he be thirsty, and thirst for water, lo! The blessed fountain is in your dwelling. And if he be sick and ask for healing, lo! The great Physician is in your house. Allow sinners to look upon Me, for their sakes have I abased Myself. I will not ascend to heaven, to the dwelling whence I came down, until I bear back the sheep that has wandered from its Father's house, and lift it up on My shoulders and bear it aloft to heaven." Simon answered and thus he said to Jesus, when He had done speaking:— "My Lord, this woman that stands in the doorway is a harlot: she is lewd and not free-born, polluted from her childhood. And You, my Lord, are a righteous man, and all are eager to see You; and if men see You having speech with the harlot, all men will flee from beside You, and no man will salute You." Jesus answered, and thus He said to Simon when he was done speaking:— "Whosoever it be, open for him to come in, and you shall be free from blame; and though his offenses be many, without rebuke I bid you [receive him]." 15. Simon approached and opened the door, and began thus to speak:— "Come, enter, fulfil that you will, to him who is even as you." The sinful woman, full of transgressions, passed forward and stood by His feet, and clasped her arms in prayer, and with these words she spoke:— "My eyes have become watercourses that cease not from [watering] the fields, and today they wash the feet of Him Who follows after sinners. This hair, abundant in locks from my childhood till this day, let it not grieve You that it should wipe this holy body. The mouth that has kissed the lewd, forbid it not to kiss the body that remits transgressions and sins." These things the harlot spoke to Jesus, with much weeping. And Simon stood afar off to see what He would do to her. But He Who knows the things that are secret, beckoned to Simon and said to him:— "Lo! I will tell you, O Simon, what your meditation is, concerning the harlot. Within your mind you imagine and within your soul you said, ‘I have called this man righteous, but lo! The harlot kisses Him. I have called Him to bless my possessions, and lo! The harlot embraces Him.' O Simon, there were two debtors, whose creditor was one only; one owed him five-hundred [pence], and the other owed fifty. And when the creditor saw that neither of these two had anything, the creditor pardoned and forgave them both their debt. Which of them ought to render the greater thanks? He who was forgiven five hundred, or he who was forgiven fifty?" Simon answered, and thus he said to Jesus, when He had done speaking:— "He who was forgiven five hundred ought to render the greater thanks." Jesus answered and thus He said: "You are he that owes five hundred, and this woman owes fifty. Lo! I came into your house, O Simon; and water for My feet you brought not; and this woman, of whom you said that she was an harlot, one from her childhood defiled, has washed My feet with her tears, and with her hair she has wiped them. Ought I to send her away, O Simon, without receiving forgiveness? Verily, verily, I say unto you, I will write of her in the Gospel. Go, O woman, your sins are forgiven you and all your transgression is covered; henceforth and to the end of the world." May our Lord account us worthy of hearing this word of His:— "Come, enter, you blessed of My Father, inherit the kingdom made ready for all who shall do My will, and observe all My commandments." To Him be glory; on us be mercy; at all times. Amen! Amen!